It's finally here--the FINAL day of Sale-a-bration. This is your last chance to place an order and earn FREE products. It is also your last chance to sign up and get TWO FREE stamp sets when you join plus have the opportunity to earn one more FREE stamp set in April, May, or June. If you want to talk to me to answer questions, you'll need to contact me before 5pm today. After that, you can still buy and join by accessing my website, but I will not be available to answer questions. And, don't forget that you can still RSVP yes for the April online class through tonight. That will give you a chance to use your purchase of the stamp set for that class toward earning a Sale-a-bration item. In honor of the last day of Sale-a-bration, enjoying viewing this gallery of some of the cards I have created using Sale-a-bration items. Some of these have been featured on this blog before and some are new. If you still would like to take advantage of Sale-a-bration or even join or shop afterward, you can do it here. Sale-a-bration is nearing it's end. In fact, it will be finished tomorrow night. So, in honor of Sale-a-bration, my video this week will be making a card with Sale-a-bration products. Also, in honor of Sale-a-bration I have extended the RSVP time for April's online class through tomorrow night, March 31. Check out this week's video to see how to put this card together as well as get to watch some show and tell. The Tasty Treats DSP is also a Sale-a-bration item, but it also available in the Occasions catalog. To get this as a FREE Sale-a-bration item, you must enter the Sale-a-bration item number. I've had such a great time creating for challenges, I spent some time this week looking for more. :) In fact, the two that I decided to follow inspired me to create one card that fits the criteria for both challenges this week. This card fits SUO Challenge #171--A Favorite April Theme and Fab Friday 108. My favorite April theme (at least on the years it falls in April) is Easter. So, I started thinking about an Easter themed card and decided that would work for the SUO Challenge. I actually began my creative process today working on the Fab Friday challenge. The first step in any color challenge is to inventory my own products and see what I have in each color of the challenge. I did have ink in Peekaboo Peach and Calypso Coral, but only paper in Mint Macaron and So Saffron. That helps me decide what color the card base will be and brings the design together in my mind. Once the card was finished, I realized I had created an Easter card which would work for the SUO Challenge as well. I ran into a dilemma today. I wanted to focus on Sale-a-bration items this week during the last few days of Sale-a-bration. But, I also got a box today with new products that I wanted to spend time playing with. What to do? I finally settled on a project using both new stamps and a Sale-a-bration item. I have just been playing with the "Best Decision Ever" stamp set today. This is one that is only available to Demonstrators and I have been so excited thinking up all the possibilities for it. I'm glad I went ahead and added it to my collection. It is retiring and won't be available soon. So, if you love it, you might want to consider becoming a demonstrator today. :) I'd love to have you on my team. I plan to use a card we made in class this month for my customer cards, so I wanted to make something special for those who had the chance to make that card for themselves. I used the Tasty Treats DSP on the notecards along with some to decorate the envelopes. This paper is stunning. You need to see it for yourselves. Enjoy the pics of the individual cards. I didn't manage to get this week's Global Design Project finished until last minute yet once again. But, I've been spending all week designing this project in my head. When challenges are announced, I try to figure out something that will both fit the challenge and what I happen to be focusing on that week. While that doesn't always work, it did this week. I am focusing on Sale-a-bration items through the end of March. When I think about the theme for this week, I immediately thought of food trucks. One of my favorite parts of visiting fairs, carnivals, festivals, etc. is checking out all the amazing food truck availabilities. Whenever we have visited an amusement park, so I wanted to create a card with multiple food truck options. I had so much fun using different DSP, and coloring tools to create several different themed food trucks. Which one do you like best? 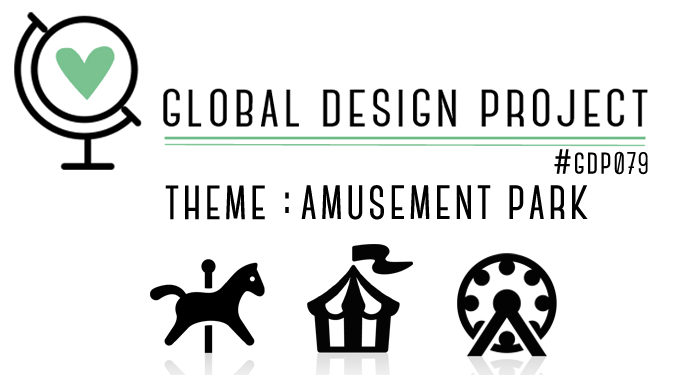 Check out all the other designs for #GDP079 as you think about amusement parks this week. 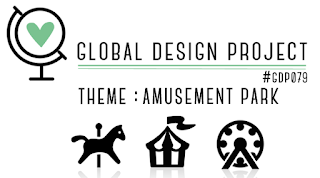 Click here to check out the other entries in this weeks Global Design Project. Let these cards transport you in your imagination to the amusement park of your choice. To buy the products needed to create this card, click on each individual product above or click here to shop in my store. Tonight was my final class before Sale-a-bration ends and we got to play with Sale-a bration items. I am always so impressed with every one's creativity at class; I always wish I could remember to take pics of all the cards. I love how everyone interprets the same design a little differently and leave class with individual and equally beautiful cards. However, I can't ever remember to take photos, so you just get to look at mine. This design was inspired by Cynthia Millan's entry on the Thailand Achievers Blog Hop. I decided on Sweet Sugarplum since it was the only color I had enough cardstock for class and the matching ink color. We had so much fun using an embossing folder with the Big shot as well as the heat gun and embossing powder and the emboss resist sponging technique. The next project was choosing a piece of In Between the Lines DSP for the front of a card and color in as much of it as you want. You can choose to draw attention to any part of the design or choose to leave it all uncolored for the recipient to color in themselves. We got to play with markers, watercolor pencils, and blender pens. For our new technique card of the night, we got to try the Marbling technique together. I had first tried it at home using my favorite cool colors: Elegant Eggplant, Island Indigo, and Garden Green. After a couple of tries, I decided those colors were a bit too dark for what I had in mind. So I switched to different colors: Peekaboo Peach, Flirty Flamingo, and Sweet Sugarplum. I love those colors together I made 11 cards with them and then decided those were the colors I would be using for class. I also decided these would be my customer cards for the month unless you were at class tonight and made one for yourself. Which color combo do you like better? Are there any stamp sets or other products you would like to play with at a card class sometime? To purchase products to create these cards, click on individual products above OR click here to shop in my store. April Online Class: "Sprinkles of Life"